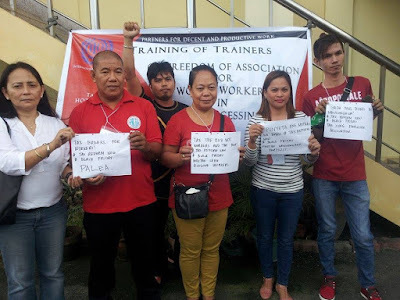 The workers party list group Partido Manggagawa (PM) today condemned the Aquino government for rejecting the proposed bill lowering income taxes as it called on its members to join the Black Friday protest. “If Heneral Luna was alive today, he will be part of the #BlackFriday protest while shouting ‘Punyeta ang mataas na buwis sa manggagawa!’,” exclaimed Rene Magtubo, PM national chair and one of its partylist bets for the coming elections. Magtubo stated that PM members in factories are holding lunch break actions today in support of the #BlackFriday protest called by groups pushing for lowering of income taxes. “Factory workers in Metro Manila and the export zones in Cavite and Cebu, and also members of the Philippine Airlines union PALEA are participating in the #BlackFriday protest.” Magtubo explained. PALEA members are holding pickets today at Philippine Airlines offices at the airport to demand the reinstatement of 117 employees to be laid off on November 30. 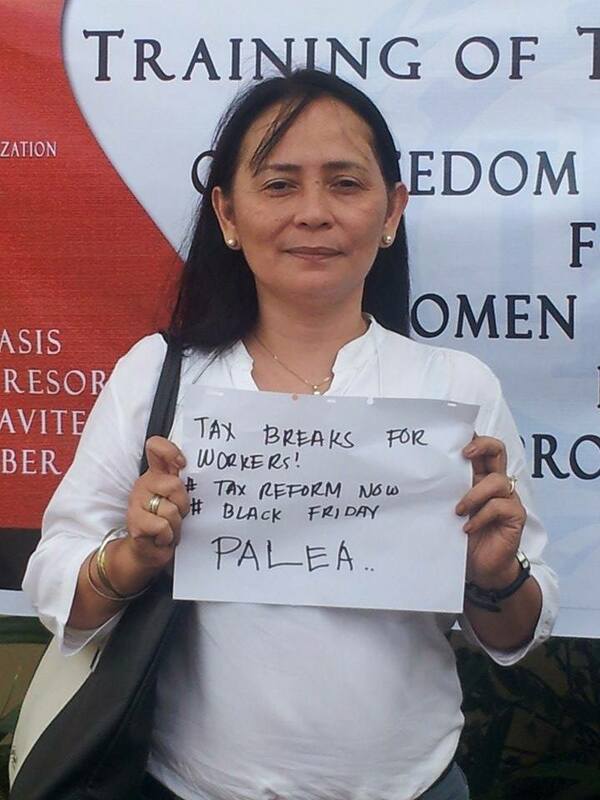 Besides opposing the mass layoff, PALEA members are also raising the call for lowering income taxes. “Inclusive growth is just a marketing gimmick if it cannot be made concrete by tax reform benefiting workers. Workers, as fixed income earners subject to withholding taxes, carry the onerous burden of primarily financing the coffers of the state but suffer from poor social services that are subject to political patronage,” Magtubo elaborated. He challenged presidential candidates to heed the clamor of workers for progressive taxation and lowering of income taxes. “Mar Roxas’ alibi that tax reform during the election season is not timely is a lame excuse. If daang matuwid does not lead to tax reform then it is a deadend for workers,” Magtubo argued. PM vowed to push for tax breaks for workers as part of its electoral platform. The labor partylist group’s “Apat na Dapat” platform includes lowering of prices, living wages, regular jobs and quality public services. PM insists public services must be funded from the proceeds of progressive taxation that shifts the burden from workers and the poor to the rich and employers.